I will be taking a short break over the holidays and will be closing my online shop until January 2nd. I am excited to do a bit of relaxing, spending time with my family, making goodies and taking a teeny road trip. 2019 wall calendars are now available all sold out! This stapled 12 month calendar features prints of my original paintings for you to enjoy throughout the year. 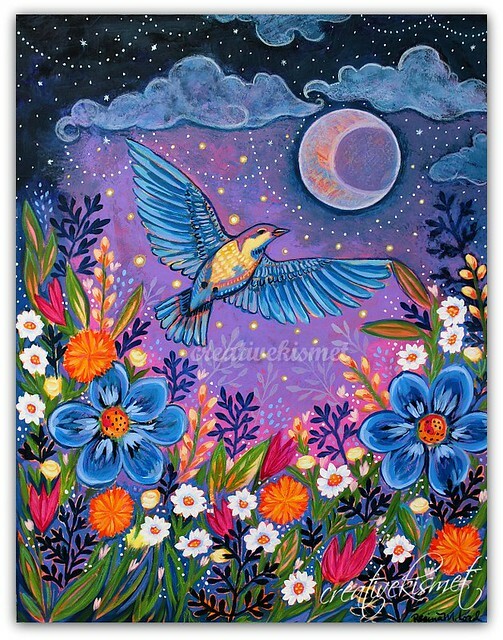 Bright, colorful, beautifully vibrant — filled with whimsical birds, flowers and happy magic. Art illustrations fill the top half, with a calendar grid below providing lots of writing room for all of your appointments, birthdays and other important events. Here in the Southwest, we finally had our first day of fall weather with rain and cool temps. It will warm up again for sure, but it sure was lovely! I made the little painting above while blissfully listening to the rain. And did you know that it is Art Season? One of my favorite art collectors said to me the other day, “Have fun getting ready for art season!” Her husband’s reply was, “There’s an art season? Is it like football season?” It sorta is, if it means getting all excited about art! Art Season is the time of the year in Tucson where we wake up from the sleepy summer heat and get ready for artisan holiday fairs. That means, lots of art making of all kinds. Want to learn how to paint this sweet flowery girl?! I’m a guest teacher for the month of October over at True Colors. I’ll be teaching you how to create this fun, Frida-esque painting, in two 30 minute videos. Together we’ll go through basic face drawing, how to do simple skin tones, and making a flowery crown. With a membership to True Colors, you have access lots of videos (including mine) and new inspiration added every week! Only $26/month to join in. Sign up by the month or do an annual subscription. .
New card designs are now available in my shop! Each 5×7 card is printed by me, with archival inks on beautiful archival paper. Archival just means that it will last a long time with no fading, making them frame worthy! There are 35 designs total, so hop on over to take a look! Ever After – Registration is OPEN! Disclosure: The links in this post are affiliate links, meaning, at no additional cost to you, I will earn a commission if you click through and make a purchase. It’s how I get paid! Thank you!! Get 20% off all packages by using coupon code: MAGIC2018 at check out! Are you excited? Are you ready to get your happy fairy tale magic on? I am ready and I am so excited! Please use my *affiliate link to sign up! And don’t forget! There is still time to enter to win a spot and learn more in the previous post – click HERE! You have until Wednesday at midnight!! Class starts June 1st ~ I hope to see you there! I have some wonderful & exciting news to share with you today! I am going to be teaching on Ever After this year! To celebrate, I am giving away 1 space for this magical art course! First, Ever After is a mixed media art & style development course with a fairy tale theme hosted by Tamara Laporte from Willowing Arts. Tamara and 14 popular mixed media art teachers will all share beautiful fairy tale & myth inspired lessons with you AND they will share hints and tips on how they developed their own style and how YOU TOO can find your own unique voice as an artist! My chosen fairy tale is The Water of Life. It is a Spanish fairy tale involving a princes who saves the day, of course, a bird, a branch and some magical water. Sound intriguing? My lesson will be inspired by this wonderful story and elements and I promise it will be beautiful and magical. I’m excited to be sharing my mixed media techniques and style with you. Here are some examples of my work, if you are not familiar with my style. Registration is NOW OPEN and the class begins on July 1st 2018. So if you want to start your summer drawing and painting fairy-tales, exploring your own personal story and style and hang out with a wonderful creative community of like-minded souls, be sure to join once registration opens! Keep this page bookmarked so that you can sign up the moment it goes on sale! Blog Hop & Giveaway: One lucky winner will win a space in this year’s Ever After. Follow the blog hop (see below for links and dates) you can up your chances of winning a space by entering all the other giveaways as well! Here is the list of the other amazing teachers who will be teaching on Ever After this year – they too will be giving away a spot on Ever After so go check them out and enter their give-aways! 14th May Regina Lord –>> blog.creativekismet.com <<– You Are Here! This is the last day of the blog hop! Don’t forget: Registration is NOW OPEN!! Keep this page bookmarked so that you can sign up the moment it goes on sale! Thank you for participating and good luck!! When I was in the midst of cleaning out my studio to re-paint, I decided I had to do something about my floor. It is etched and stained (warm golden yellow) concrete floor that we had professionally done almost ten years ago. After many years of art and craft mayhem, it was looking pretty sad and permanently dirty. I had also painted a small mandala on the floor, but knowing my new layout, it was off-center and faded. To fix this, I decided to paint a giant mandala over it. It also helped to cover some unsightly paint and ink stains that were on the floor. I used leftover paint that I found in the garage to make a large, solid circle as my blank canvas. I used regular indoor house paint – Valspar samples to be exact, in satin finish. They were awesome! I had all my favorite colors made and it was the perfect amount of paint. Not too expensive–a few dollars per paint color. I made a pencil-string compass to draw out the circles and used Stabilo Woody 3-1 pencils to draw out the design. I used a kneeling pad to sit on as I scooted around the floor painting. It took about 8 hours of straight painting time and my back and neck were not happy when I was done, but it turned out great and I love it. The thing about this floor is that you can’t be “precious” with it. It’s going to get ruined over time if you plan on walking on it, or in my case, roll around on a chair over it. I’m also a very messy painter. I spill and splatter things all the time. So, I choose not to worry about it. I sealed it with a satin varnish and have since mopped it with cleaner several times. It’s holding up well. I may have to paint over it someday, but I think it will be good for a long while. I spent most of January remodeling my home art studio. Here are some before and after photos. Boy, was it ever a lot of work! It took me about 3 weeks to complete. The before pics were taken after 3 months of holiday art fairs, so it was a disaster and I felt like everything was closing in on me. I was also getting very tired of that yellow/green color on the walls. I painted the walls white and my table too. It’s made a big difference on how much brighter it is now. I have a new standing easel, peg board for my art and an inspiration cork board on the door that goes out to the garage. I cleaned up and organized my old Ikea cube shelves. I know exactly where everything is now. New shelves, cabinets and counter top space. I keep a lot of my items for sale here (prints, cards, art blocks, necklaces, etc) for when people come over to shop. I’ve been very fortunate to have this little space in my home for the last 10 years and have been working incredibly hard in my art business. I thought it was about time there was some sprucing up and am so happy with how it all turned out. I never want to leave!! A sweet and happy bird dancing in the moonlight. Art prints in my shop.